This month I am leading the on-line course Nature Awareness 1. During this course I teach nature observation skills and methods for waking up our natural awareness and the tracker inside us. We have loads of on-line discussions about philosophy, states of consciousness and much more. One of the concepts we cover is being in the heart or heartspace instead of being in the head or headspace. In our modern culture people seem to be in the head most, if not all, of the time they are awake. In the head we are ready for physical action, in a constant state of stress. We go through the day in tunnel vision and are fairly closed off to subtle perceptions and our intuition. We pursue goals so far removed from our original function that we do not even notice that we are forgetting to experience the world around us. Time has taken the role of awareness. Instead of naturally being aware of our environment and the people around us we need a schedule to keep connected. Anyways, yesterday we had another interesting group chat on these subjects. Today I got a question from Anna, one of the students in this course. The question was simple enough yet interesting but I could not in my wildest dreams have foreseen the impact answering it was going to have on me. What happened was a bit the same as what I wrote about in a previous post called 'The Answer'. Here again, my answer contained another message. A much scarier message. First, here is the summarized question: Do you think dogs live more in heartspace than in headspace? As I believe that heartspace is the natural state of consciousness. I thought I had a short answer. I am pretty sure my own dogs are very much in heartspace when we are out mushing or in almost any other situation I interact with them. The only time I would say they are not in the heart is just before the start of a tour or if they are fighting. Predators, after the stalk, when they initiate the attack, will be pretty much in the head too. I started to falter a bit with my answer though. If you are stuck with your foot in a railway track and you see a train approaching you are in a great deal of stress. I have read that people in mortal peril become ultra aware as all senses kick into overdrive and time perception changes to the point that a second can feel like an hour. I have no doubt animals experience the same things. This state is certainly headspace but in a very natural context. I started to see that the question must be about dogs being in an unnatural headspace. The type of stress and flux of thoughts I associate with headspace is more like: pure logical reasoning, self gratification, anger and all other emotions, feeling insufficient at work or in your personal life, being unable to find the time to keep up with all your social media, feeling the pressure of having to earn money and many other worries. The list is endless and you all know what I mean. It is all about chasing the trivia in life we call civilization and culture. Normally dogs do not do that. Yet, there are all sort of animals, including dogs, that have issues. I felt there was something I was missing. The only time I notice the type of behavior in animals that I feel is equivalent to what I describe to be 'being in the head' is when the are in captivity! Technically our dogs are in captivity but they have learned to see their human captors just as their pack and are pretty happy with that. I mean more the tiger pacing his cage or the elephant neurotically shaking his head in the zoo. 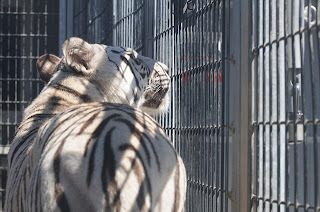 They display this behavior because they can not flee their fears, they have been deprived of there freedom and connection with the natural environment. They are cut off from the essence of being a wild animal. Now for the scary bit. If that is true for the tiger and the elephant what about us? Are we living our so called modern lives in the head because we are in captivity? Are we denied our true purpose? If so, we have at least one advantage over the zoo animals. Our cage is only constructed by our own imagination or rather lack of it!